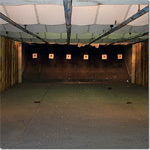 Bullet Stop, Inc. has a state of the art indoor firing range. The range has six shooting positions, each fifty feet in length. 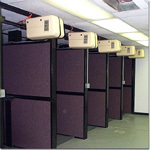 Each position has an electric target carrier with folding tables and barricades. Targets and equipment were made by Detroit Armor Company, a renowned manufacturer of target traps and range equipment for more than 25 years. On the range, one may shoot any handgun or rifle chambered for handgun cartridges. The range rates are $10.00 per half hour per stall $18.00 per hour per stall. Each stall has a maximum capacity of two people. Firearms are available to rent. Reservations are not required but are accepted. The range is fully heated in the winter months and air conditioned during the summer. Why sweat or shiver? Shoot with us! Bullet Stop, Inc. is a member of Glock, Springfield Armory, and Steyer range programs. A certified Glock Armor is available on staff to aid patrons with any of their needs.